Heat Belgian or regular waffle maker according to manufacturer's directions. Separate dough into 10 biscuits. Press or roll each to form 4 1/2-inch round. Depending on size of waffle maker, place 1 to 2 biscuit rounds at a time in hot waffle maker. Bake about 2 minutes or until golden brown. Remove to cooling rack. Immediately place 1 slice cheese on each hot waffle. Spread 1/2 teaspoon mustard over cheese on each of 5 waffles. 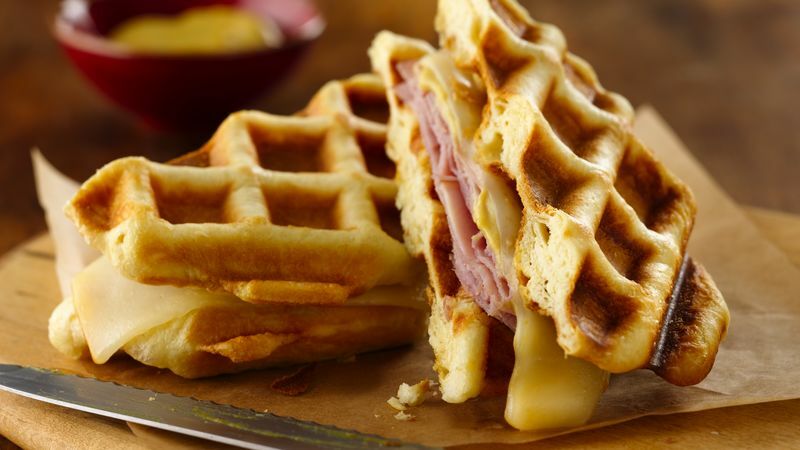 To assemble sandwiches, divide ham evenly among the 5 cheese and mustard-topped waffles; top each with another waffle, cheese side down. Serve warm. Ask at your deli for honey-roasted or honey-baked ham to add another sweet touch to these sandwiches! Omit the sweet honey mustard, and drizzle a bit of warm honey over the ham instead.